Public dissemination material including logo, leaflet, poster and roll up are available here for download. The logo gives an image of environmental orientation to the action, promoting the green colour. A “container vessel” can be distinguished, gathering so the main topics of the project: ship logistics and environment. Different colours (green tonalities) of those “containers” represent that the project aims at addressing varying types of cargo. Different sizes means covering a huge range of port size as well. Moreover, the pixels of the back of the vessel symbolize the digital transformation of ports, real basis behind which PIXEL relies. In the process of elaboration, the following guidelines have been considered: (i) Colour palette, (ii) Consistency with the content on the website and on the official poster, (iii) inclusion of the main elements of the project: Use-cases, PEI, Impact, Project slogan and main ideas, (iv) IInformation about the Grant Agreement, (v) EC logo and the same sentence than in the poster. It is expected to create more leaflets for PIXEL communication during the project. With every release of a new leaflet accepted by the PIC of PIXEL, this deliverable may be updated. 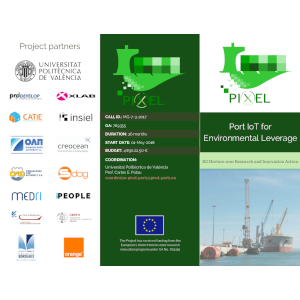 Most of the important dissemination actions of PIXEL will be carried out in congresses, fairs, technological workshops and similar events. PIXEL Consortium is expecting to hold a booth in some of them. Because of this, having communication support material to show PIXEL project in those scenarios seems crucial for the goals of impact creation of the project. One of the main tools that will be used in this context will be the official poster of the project. 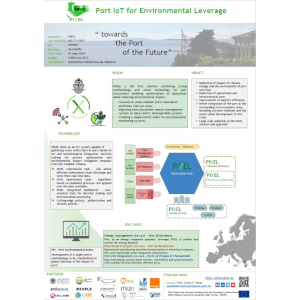 Similar to the poster, most of the important dissemination actions of PIXEL will be carried out in congresses, fairs, technological workshops and similar events. PIXEL Consortium is expecting to hold a booth in some of them. Because of this, having communication support material to show PIXEL project in those scenarios seems crucial for the goals of impact creation of the project. One of the main tools that will be used in this context will be the official roll up of the project.